Phillips 66 and Kinder Morgan Inc began on Monday soliciting shipper commitments for crude deliveries on the 900,000 barrel per day (bpd) Gray Oak Pipeline from the Permian Basin to delivery points at or near the Houston Ship Channel, the companies said. 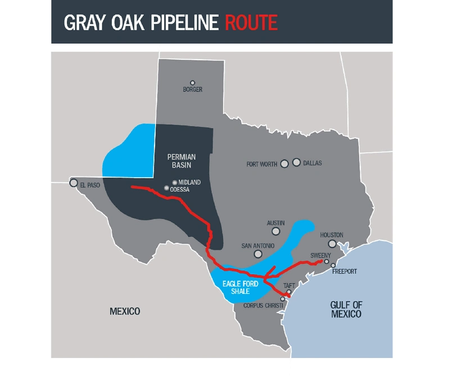 The Gray Oak Pipeline would deliver crude to the Houston area through a connection in South Texas. The pipeline is one analysts believe could help alleviate a crude oil transportation bottleneck in the Permian Basin of West Texas and New Mexico.